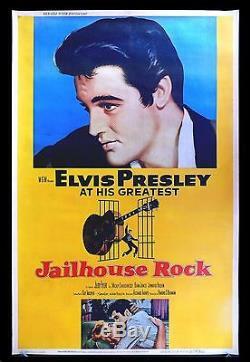 40"X60" CARD STOCK ORIGINAL MOVIE POSTER 1957. If it has any minor defects like pin holes, creases, etc. Fans have been waiting for! This is a genuine 40"x60" U. ORIGINAL MOVIE POSTER issued by the studio when the film was released and meant for theatrical display. These can be very difficult to find in any condition! A long time can go by without one of these coming up for sale. You will have trouble finding a nicer one. This is an unbelievably rare size for this poster!! Most collectors have never even seen this size for this title. Most of the defects were repaired and now it looks beautiful! It does NOT look "perfect" and still has some minor creases, border wear and other wear. It is NOT paper backed! It is starch mounted with gelatin. The larger tears were repaired with Japanese rice paper. Not one of a kind by any means.... But YEARS can go by without one of these coming up for sale. There are virtually NO recorded sales for this poster. 40 x 60's were printed in far fewer numbers than one sheets making them extremely rare. They often sell for more than the one sheet. Collectors love them because they were issued ROLLED (never folded) and because they usually hold up much better to wear and tear than one sheets do. Usually printed on card stock. This is NOT a reprint or reproduction poster! It is a REAL ORIGINAL MOVIE POSTER issued by the studio when the film was released and meant for theatrical display. We are absolutely certain it is authentic. C9 Near Mint - Investment quality. Minor flaw on an otherwise unused poster. C8 Excellent - Investment quality. C7 Very Good to Excellent - Fine condition. Still a very nicely preserved item. C6 Very Good - The typical used poster in average condition. C5 Good to Very Good - A heavily-worn item. C4 Good - Below average but still suitable for display. C3 Fair - Heavily worn, but yet still complete. C2 Poor to Fair - An extremely worn, possibly even incomplete item. For more information about CineMasterpieces please see. We guarantee that all posters we sell are graded and described accurately. Unless otherwise specified in the description, ALL POSTERS ARE ORIGINAL MOVIE POSTERS original theatrical movie posters that were displayed or meant for display (unused) in theaters at the time the movies were released. We will put in writing that we guarantee it to be an Original Movie Poster. 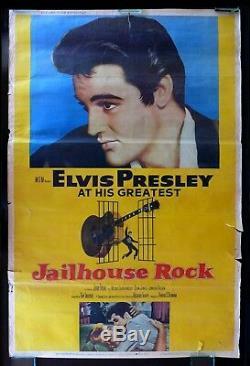 The item "JAILHOUSE ROCK CineMasterpieces 40x60 ORIGINAL MOVIE POSTER 1957 ELVIS PRESLEY" is in sale since Monday, November 12, 2007.